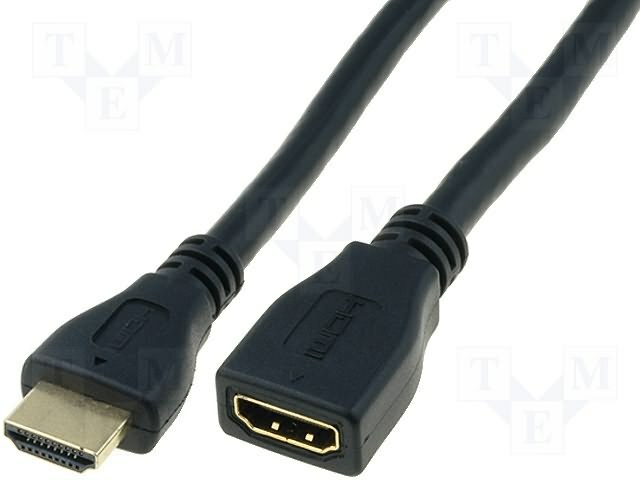 HDMI extension cables are high quality cables for digital data transfer that allow extension of a standard cable ending with a standard A type pin. From one side, they are terminated with a standard A type HDMI pin, whereas on the other end, they are ended with A type HDMI socket. Thanks to gold-plated terminals and double screened oxygen-free copper conductors, they guarantee transfer of high quality, low-compressed image and sound. High Speed type HDMI with Ethernet extension cables ensure support for resolutions exceeding 1080px, including Deep Colour technology as well as all 3D formats provided in the HDMI 1.4 specification. They also facilitate using Ethernet network channel supporting resolution higher than 1080px. High Speed HDMI with Ethernet extension cables are an ideal proposal for customers valuing high quality of workmanship.